I just got home from the ship Friday and the weather here has been cold and miserable. Damp and dreary, drizzling and gray. Yuk! 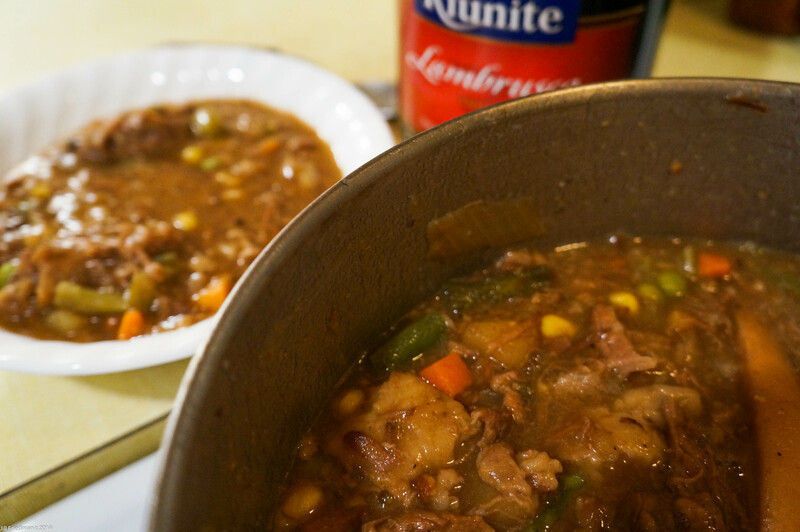 So, I decided to cook up a pot of my favorite beef stew. It’s great stuff to have when it’s cold outside. It’ll fill you up and keep you satisfied for a while. I remember the first time I made it. I actually had quite a bit of help. I had recently moved out of my dads house and rented a little efficiency apartment from him across the street. I was working on the party boats down the block and a couple of other jobs too, plus going to school so I wasn’t really into cooking all that much. One of my jobs was as a dishwasher at a Greek place on the corner. They let me eat there for free, so that took care of dinner most nights. The other job was as a galley hand on the party boats. I sold ready made sandwiches and drinks to the passengers when they wanted a break from fishing and helped with things like getting lines untangled, baiting hooks, and cleaning the decks. Part of the deal was I got to eat (and drink) for free. That was only on the weekends. So, they came by. Storm’n Norman, O’Brian (OB), Bucky, and Danny, with a hunk of meat, some potatos, carrots, onions, and a BIG bottle of Lambrusco (the secret ingredient). We would check out the progress, throw in some stuff, stir it up, add a shot of wine, then pass the bottle around. I’ll never forget cooking up that pot of stew. It smelled so good! It was delicious! And I still make it the same way. If you want to try to make a pot. I’ll give you the start, but it’s mostly just a few basics and then throwing in whatever’s around. Throw the butter in the pot with the onions and stir it around a bit. Then throw in the meat to brown. Season it up with some Worsteshire sauce, onion salt, garlic, celery salt, Mrs Dash, pepper, or whatever else you like for seasoning. Once the meat gets browned, add a little water (couple of tablespoons) and a couple of shots of the wine (I like to use Lambrusco). You can add the boullion cubes and celery any time. Once the meat starts to get tender, add the carrots and potatos. You’ll need more liquid now, so cook up the gravy in a small pot and add it to the stew once it thickens up. From now on, you can add whatever you want. I wait to add the frozen vegetables til near the end, since I like them to still be nice and bright colored (and not mushy). I usually add a package of mixed vegetables, maybe a pack of cut green beans, maybe some green peas, just depends on what I have in the freezer. Sometimes I like to add fresh mushrooms. 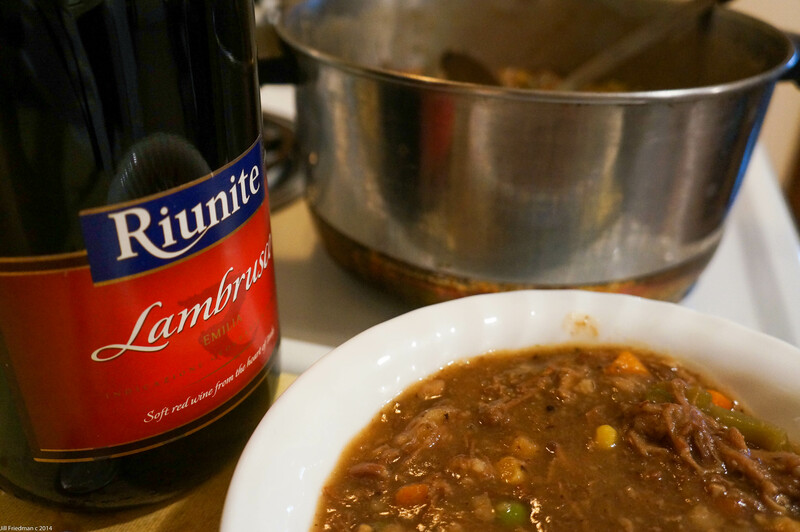 This entry was posted in blogging, food, lifestyle and tagged #beef stew with red wine, #Capt Jills Favorite Beef Stew, #cooking with wine, #fun with friends, #good food, #Lambrusco, #wine, cooking, recipe by Capt Jill. Bookmark the permalink. Congrats on being a guest blogger with your stew recipe. I enjoyed the story behind the stew also.